If you liked last week’s blog about the Berzins, a family of four living in a 320-sq.-ft. home, but didn’t care for the rustic look of their modern-day little house in the mountains, I’ve found another tiny house you might like better. 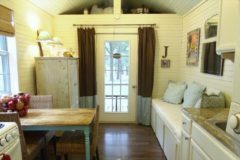 Debra and Gary Jordan built their 320-sq.-ft. cottage-style home in Siloam Springs, Ark., (for $20,000, plus a monthly land fee) because they wanted to live a simple, debt-free lifestyle. Like Harry Berzin, Gary Jordan lost his job when his company closed in 2008. Both couples responded to unemployment by moving into extremely small homes that simplified their lives. Ironically, Siloam Springs is just down the road from Bentonville, home to the world’s largest purveyor of stuff, Walmart. Hats off to anyone who can live in the shadow of Walmart in a house so small that you need a strategic plan if you want to bring in new stuff. The Jordans recently added on to their one-story, one-bedroom cottage by building a 9-by-10-foot room upstairs that doubles as a television room and a bedroom for their teenage son, Max. The addition expanded their home to 400 sq. ft.
A second 18-by-8 foot cottage houses the family’s new business workshop, where they create and sell minkee blankets for babies, toddlers, and teens. Debra says the key to making a small house work is having rooms and furniture serve more than one purpose. “My counter space is short, so the table is prep space.” When they have guests (and they entertain a lot), the Jordans pull the dining table over to the sofa and set up a second folding table, transforming their main living room into a dining room. There’s also a small dishwasher hidden under the built-in sofa. You have to admire the Jordans for their adaptability in carving out a new lifestyle when facing financial challenges. Personally, if my family had to move into a tiny house, we would end up using our multitude of stuff to beat each other to death. This entry was posted on Wednesday, May 31st, 2017 at 9:15 am	and is filed under Random Thoughts. You can follow any responses to this entry through the RSS 2.0 feed. Both comments and pings are currently closed.